My name is Tracy and I live in beautiful Brisbane with very patient husband, two crazy kids (a girl and a boy) and two adopted ex-racing greyhounds - Dolly and Zeppelin. I work part time but ideally would love to create beautiful things on a full time basis. I love everything crafty but particularly love creating with paper, wood, glitter (lots of glitter! ), ribbons, inks and paints. I hand make and hand colour greeting cards, gift tags, stationery items and make jewellery using paint and Japanese chiyogami paper. I mostly use Japanese or scrapbook papers, copic markers, water colours and coloured pencils to paint and decorate my spare time away. I get most of my inspiration from the many crafting blogs I visit and of course Pinterest! I also get a lot of inspiration from trips to my local crafting store. 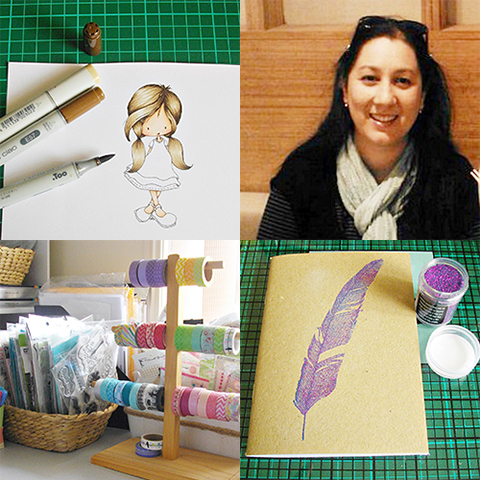 When I make cards, I choose the papers I want to use first and then colour my chosen stamp/digital image. Hand colouring greeting cards with copic markers or my beloved PrismaColor pencils give me the most satisfaction and I love nothing better than assembling embellishments and putting them all together with glitter and glue to make my greeting cards. I have always been a crafter. I used to decorate my school books, my diary and anything else I could get my hands on. Paper crafting and colouring/painting has been my outlet for as long as I can remember. I had a lot of trouble coming up with a business name for quite some time. Eventually, I went back to basics and decided that I liked making trinkets and I liked making art pieces. When you put trinkets together with art you get TrinkArts. I probably visit about 30 crafting blogs on a regular basis. These blogs range from card marking, upcycling clothing, scrapbooking and mixed media. I learn most of my new techniques from YouTube tutorials and from my crafty friends. I am also currently doing an online colouring technique course. Include as many photos of your product as you can in your listings and get yourself some great editing software for your product photos and learn how to use it. I use my listing description to include as much detailed information about the product I’m selling so the buyer can get a real ‘feel’ for what they are purchasing. If you are using a photograph of your product in an advertisement, make sure it is the best photo of that product that you have. I like to use a different photo in every online advertisement that I purchase, and mostly use new product images. Invest in business cards or flyers that include a link to your online store and include one with each order you send out or give one to every person who purchases from you at a market. Keep business cards in your purse/handbag at all times…you never want to be caught out when an opportunity to tell someone about your products appears from nowhere! Learn how to take great photos of your product! I cringe when I look back at the original photos of my first items online. Decide on a brand as early as possible, unless you’re like me and can’t decide and change my shop banner yearly! I love to spend time with my family and greyhounds, catching up on TV and movies and hanging out with friends for a coffee. Music – I love lots of different types of music including anything from Metallica to The Lemonheads to classical music. TV – Dare I say it…True Blood! Also Game of Thrones, Big Bang Theory, Offspring and Downton Abbey. Films – Practical Magic and The Princess Bride are my two favourite all time movies, followed closely by any period movie ever made like Pride & Prejudice, Sense and Sensibility, Little Women etc. Book – I don’t get a lot of time to read (too busy watching trashy vampire TV). My perfect day would be on the beach of a deserted tropical island, soaking up the sun and listening to the waves crashing on the sand while surrounded by my family and closest friends, with lots of good food and good cheer. Two Ginger Designs - I bought a hobo handbag and I love it, the finish is fantastic and I use it all the time!